As the world enters its post-sunset dusk, I watch as a white Prius decked out with an amber roof light noses up to the curb. Weinberg senior Kira Riley sits behind the wheel. 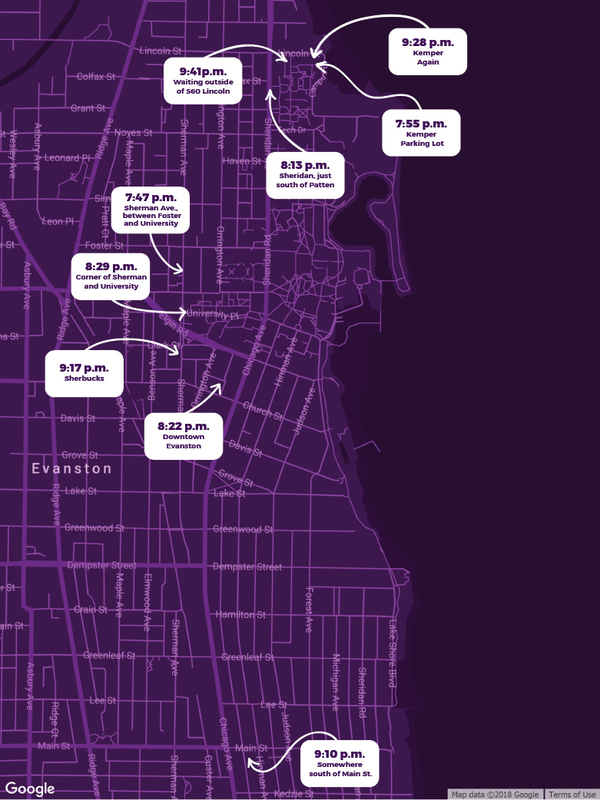 It’s a Friday night – a busy time for SafeRide, Northwestern’s free ridesharing service – and she has to get to a pickup. An 21-year-old African American, Kira projects an air of cool confidence. She’s dressed comfortably – a black fleece over a t-shirt and dark tights – and sits relaxed in the driver’s seat, running a hand through her brown spiraled hair as she pilots the Toyota back out into traffic. The soothing sounds of Khruangbin’s Con Todo El Mundo – a recommendation from a friend – drift out of the speakers and meld into the night’s chill atmosphere as we head north, street lights flickering on. At 7:55 p.m., she pulls into the parking lot of Kemper Hall, tapping on the dashboard iPad to notify the riders she’s there. They’ve got three minutes to get to the car. This time, however, the riders make it with less than a minute to spare. Two young female students clamber into the backseat and quietly chat as Kira turns south toward Kung Fu Tea. She drives with a relaxed posture, turning a corner with the force of her thumb as her other hand rests on the wheel. The Prius plows down Evanston’s potholed streets, its suspension seemingly designed to transmit every bump to the passengers. Suddenly, she slams on the breaks. The passengers straighten up, instantly alert. 8:13 – Sheridan, just south of Patten. Kira fumbles for her walkie talkie while turning. “Is the pickup for Goodrich Sargent parking lot?” Dispatch replies: “It should be Patten.” The subsequent wait is punctuated by a bolt of excitement: an SUV nearly backs into the Prius, (“He can’t park”) necessitating an evasive maneuver. 8:29 – Corner of Sherman and University. Heading north, Kira brakes hard at a stop sign. A native of Chicago’s South Side – first South Shore, then Hyde Park, and now Evergreen Park – she’s fine with city driving, and says that in contrast Evanston is “just cruising for the most part.” Senior year marks the first time she’s had a car on campus, and the first time she can drive home whenever she wants. Now, as she finishes up a double major in psychology and international studies, Kira says she was originally drawn to NU’s chemistry program because it is “top five in the nation.” The close distance to home was a plus. 9:10 – Somewhere south of Main St.
9:17 p.m. – Three guys, Sherbucks to Kemper. Sitting at the light of Church and Chicago waiting to turn left, Kira cracks her knuckles. The dual red lights project a nighttime halo on the windshield as traffic rushes by. 9:28 p.m. – Waiting for another pickup. “Thirty minutes!” Kira exclaims, drumming on the steering wheel. Drivers get one break each night, and hers starts at 10 p.m.
9:29 p.m. – One male rider, Kemper to 800 Elgin Road via Norris, and then Ayers and then 560 Lincoln. Thanks to GPS and dispatching quirks, the guy crisscrosses campus in the backseat as Kira ferries two female students from Norris to Ayers, dropping them off at 9:37 p.m. feet from where he entered the car. “It made us go in a circle,” she says. “Yeah, I’m going to 800 Elgin,” he replies. But before that, another pickup – this time at 560 Lincoln. 9:41 p.m. – Still waiting outside of 560 Lincoln. The rider is late. Very late. So late, in fact, that Kira cancels the pickup. However, he walks up as she shifts into drive. This necessitates a walkie talkie to dispatch. Eventually, a plan is worked out. She’ll drop off the guy going to Elgin Road, then the late rider and then “the Medill student.” My time as a SafeRide plus one is nearing its end. Evanston’s streets are cold and quiet. On the way down Sherman from Lincoln to Elgin, we pass only four cars. The light is green, and we accelerate north past the Arch. 9:58 p.m. – Last drop-off completed, I step out onto the curb and watch the car’s tail lights quickly disappear into the night. Kira’s break is on – dinner at a friend’s place – and she’s only got an hour before she’s back on the clock until 3 a.m.